Many biological applications such as microbiology, cell culture, blood work and many others that use cells require that we determine cell concentration for our experiment. Cell counting is rather straightforward and requires a counting chamber called a hemocytometer, a device invented by the 19th century French anatomist Louis-Charles Malassez to perform blood cell counts. A hemocytometer consists of a thick glass microscope slide with a grid of perpendicular lines etched in the middle. The grid has specified dimensions so that the area covered by the lines is known, which makes it possible to count the number of cells in a specific volume of solution. 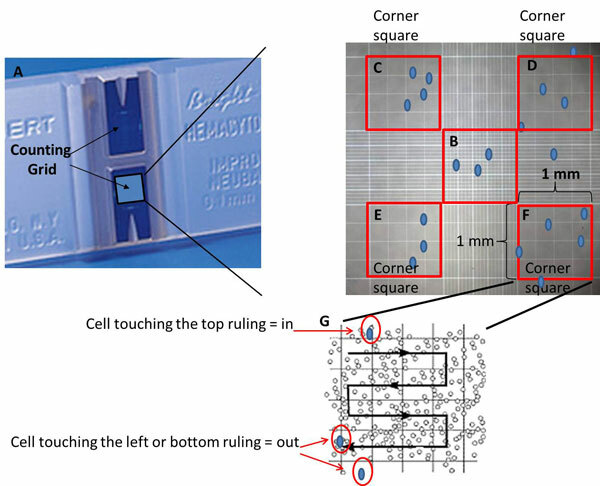 The most common type of hemocytometer has an “H” shape engraved in the middle that encloses two separate mirror-like polished grid surfaces and provides the cover slip mounting area (Figure 1). Before starting ensure that both the hemocytometer and its coverslip are clean by removing any dust particles with lens paper. Coverslips that are used for mounting on hemocytometers are specially made to be thicker than the conventional microscopy coverslips because they must be able to overcome the surface tension of a drop of liquid. Make sure to first place the coverslip over the counting surface before loading the cell suspension. Then place the pipette tip with your sample into one of the V-shaped wells, as in Figure 2, and gently expel the sample. The area under the coverslip fills by capillary action. Enough liquid should be introduced so that the mirrored surface is just covered, usually around 10 µl, but do not overfill the surface. You can load two samples on one hemocytometer, one into each of the two grids. The loaded hemocytometer is then placed on the microscope stage and the counting grid is brought into focus at low power. Allow the sample to settle for a couple of minutes and avoid moving the coverslip as it might introduce air bubbles and make counting difficult. 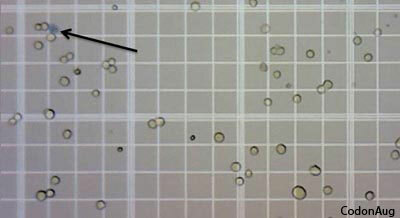 The full grid on a hemocytometer contains nine squares, each of which is 1 mm2 (Figure 3). The central counting area of the hemocytometer (Figure 3B) contains 25 large squares and each large square has 16 smaller squares. When counting, count only those cells on the lines of two sides of the large square to avoid counting cells twice (Figure 3G). Suspensions should be dilute enough so that the cells or other particles do not overlap each other on the grid, and should be uniformly distributed. Figure 3. Counting Cells on the Hemocytometer. To perform the count, determine the magnification needed to recognize the desired cell type and systematically count the cells in selected squares so that the total count is approximately 100 cells, a minimum number of cells needed for a statistically significant count. For large cells, you can simply count the cells inside the four large corner squares (Figure 3C-F) and the middle one (Figure 3B). For a dense suspension of small cells you may wish to count the cells in the four outer and middle squares of the central square (Figure 3B) or make a more dilute suspension. Remember if a cell overlaps a ruling, count it as “in” if it overlaps the top or right ruling, and “out” if it overlaps the bottom or left ruling (Figure 3G). The area of the middle (Figure 3B) and each corner square (Figure 3C-F) is 1 mm x 1 mm = 1 mm2: the depth of each square is 0.1 mm. The final volume of each square at that depth is 100nl. Originally published on 3 July October 2013; updated and republished on 8 December 2014. If I use bacterial cells and I’ve got 3×10 pwr 7 cells/ml in my tube, can I consider it as 3×10 pwr 7 cfu/ml? (noting that if only viable cells are calculated). why is the total cell count not always useful? If you use the corner and middle squares of the middle area (Figure 3B) to count, is the calculation the same? Or do you need to adjust for the difference in volume, or just divide by 1 square instead? Hello. I have a question. If I had an initial sample volume of 10 mL, then I took 30 microliters and mixed that with 50 microliters of Trypan blue, and finally used 10 microliters of this last mixture for the counting, would the original volume be 10 mL? Your dilution factor is 2.67. That is calculated by dividing 80 by 30. Please use this in the formula (dilution factor * total cells in 5 squares * 10000)/5. This will give you the number of cells per ml. That is a concentration expression. So just multiply this number with 10 to obtain the number of cells in the 10ml volume. The 10µl volume you have pippeted on to the hemocytometer is not a factor in the formula. It is actually the volume spread by capillary action per square on the grid is the one that is part of the 10000 multiplication factor. I am interested in talking to someone about counting pollen and the correct formular is anyone available to assist? Now if for example need to do 2 tests with this amont of cells (650 × 10e4 c/ml) and volume (5 ml) with specific concentrations of 0.05 x 10e4 and 1 x 10e4. How can do that? i ordered a Neubauer hemocytometer online and it came with no instructions on where to pipet the cells, there is no groove on this one. Do I just place the cover across the grids and pipet into the long groove on the side? any help would be great! Yep. The cells/liquid should flow into the grid by capillary action. Good luck! Hi Amanda, is there a way to automatically count the cells from the picture taken from a microscope camera? I’m traveling into more unfamiliar territory here. That being said, I’m fairly certain that ImageJ (free software!) has those capabilities. There are machines that will do that. How do you account for the amount of sample you placed onto the hemacytometer (10uL)? That is part of the formula. You don’t need to worry about that. great explanation. Thank you very much. kelly counted 15,16,11 and 10 HEp-2C cells from four squares of a hemacytometer. if 21 of the cells retained the trypan blue dye, what is the concentration of live cells? (information: He dispersed a part of the cells in 5 parts of the stain). hi. 780 000 cell/mL. 71% viability? really?